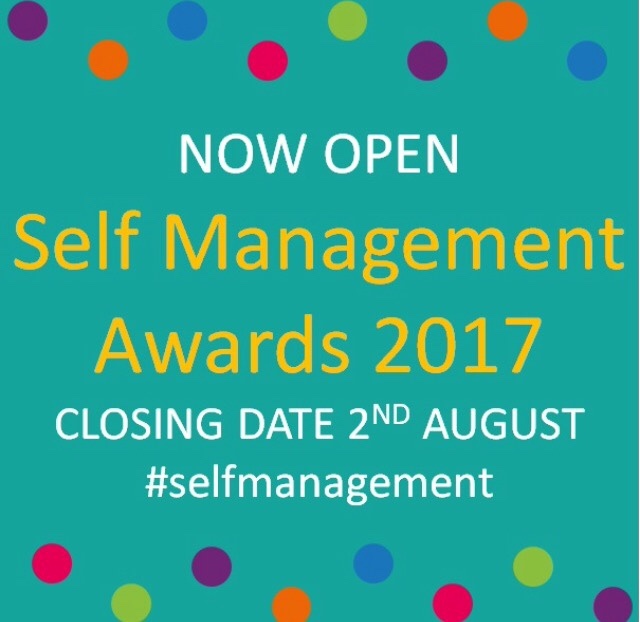 The Self Management Awards 2017 are now open. The awards hosted by the Health and Social Care Alliance Scotland will take place during Self Management Week 2017 and will celebrate examples of good practice and promote a range of innovative self management work from all over Scotland. The theme of this year’s Self Management Week is ‘Celebrating Change’ and we’re changing things up by introducing three news awards for 2017. These changes will allow us to hear about and raise awareness of all aspects of self management work across Scotland, from the staff going above and beyond to support self management to the inspiring individuals championing the way. This is you’re opportunity to share amazing work that already exists. *This award will be open to the public for voting once judges have finalised the shortlist. This award aims to highlight the success of your project and demonstrates the ability it has to build capacity of self management in Scotland, making a difference to the lives of individuals. If your project has made an impact then this is a great way to have it recognised and celebrated. This new award for 2017 wants to recognise staff working in health and social care that have gone above and beyond for people living with long term conditions to support their self management. Have they implemented new techniques or changed ideas that add value to your work or life and encouraged self management? This award is for people working in health and social care including the 3rd sector, statutory sector and new partnerships who are helping to change the culture to one that supports self management. Self Management is about supporting individuals with a long term condition to live well and this award recognises the resources which add value to the lives of individuals, enable staff working in health and social care to deliver services and provide invaluable information, support and advice on self management. This award is to celebrate the people who are helping to spread the important message of self management within communities and help to make change happen. Who inspires and encourages individuals to embrace self management who needs to be recognised by this award? Who has helped to champion an important message about self management that you would like to be recognised. This award is open to everyone. We know that self management has the power to transform lives – it is about people with long term conditions being in ‘the driving seat’. This award is an opportunity to recognise the changes an exceptional person has made to their life by taking a self management approach. Can you, or the individual you are nominating demonstrate the transformation they have made to their life using self management? This award is for those who have achieved success through partnership working. We are looking for a partnership that is helping to lead change to self management support available in their area. This would be the Health and Social Care Partnership or a cross sector team working within a Partnership area. The awards are open to everyone. Deadline for submission is 5pm, Wednesday 2nd August 2017. The winners will be announced on Wednesday 4th October 2017 at the awards ceremony at the Scottish Parliament in Edinburgh. To download your nomination form today click here. Click here for more information about Self Management Week 2017 and how to get involved.